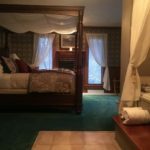 Speckled Hen Inn in Madison WI has guest rooms with private baths. 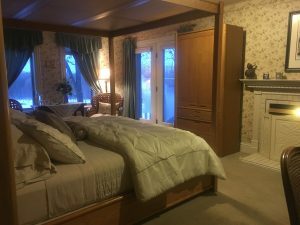 The Speckled Hen Inn has five guest rooms. Rates include a full multi-course breakfast except when noted in winter season, complimentary snacks and beverages and free Wi-Fi. All rooms have a private bath stocked with natural bath amenities, 100% cotton bath linens, hair dryers and luxurious robes. All bathrooms have a tub and a separate walk-in shower. There are also jetted whirlpool tubs in four of the rooms. 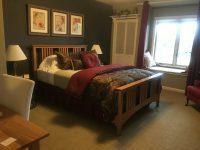 Four rooms have a king-sized bed with super soft sheets, down-alternative comforters, and a comfortable assortment of pillows. Guest rooms have TV’s connected to the satellite system with music channels and DVD players. The Inn has central heat and air-conditioning. 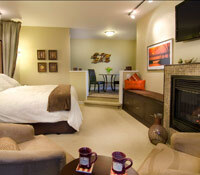 All rooms have fireplaces. Weekend rates, for selected rooms, apply to Friday, Saturday and holidays, view Reservations Policies. Please click on the rooms below for more information and photos.